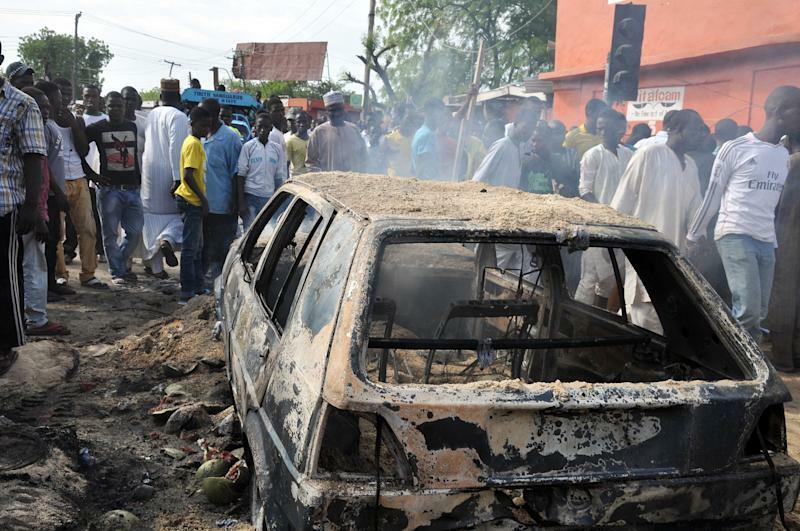 Maiduguri (Nigeria) (AFP) - Two explosions rocked northeast Nigeria on Saturday, including one by a female suicide bomber thought to be just 10 years old who blew herself up in a crowded market, as the US condemned a bloody spike in Boko Haram violence. At least 19 people were killed at the Monday Market in the Borno State capital, Maiduguri, at about 12:40 pm (1140 GMT) when it was packed with shoppers and traders. The town and at least 16 nearby settlements in and around Lake Chad were burnt to the ground and at least 20,000 people forced to flee their homes. "For five kilometres (three miles), I kept stepping on dead bodies until I reached Malam Karanti village, which was also deserted and burnt," one survivor, fisherman Yanaye Grema, said. But there was no independent corroboration of the huge numbers of dead cited locally. The US State Department said Boko Haram's recent escalation of attacks on civilians "shows no regard for human life" and called for those responsible to be brought to justice. "The United States abhors such violence, which continues to take a terrible toll on the people of Nigeria and the broader region, including Cameroon," it added. "The girl was about 10 years old and I doubt if she actually knew what was strapped to her body," he told AFP. Witness Abubakar Bakura said: "The blast split the suicide bomber into two and flung one part across the road. "Among the dead are two vigilantes who were searching the girl. I am pretty sure the bomb was remotely controlled." A Red Cross official, who declined to be named, warned: "Many people sustained life-threatening injuries." Borno State police spokesman Gideon Jubrin told reporters 19 people were killed and 18 others were injured but warned that the death toll could rise. An attack at the same market on December 1 killed more than 10 people, and a week earlier more than 45 people lost their lives in an attack there. On July 1, at least 15 people were killed in another suicide attack there blamed on the militants. Forced conscription of young men and boys by Boko Haram has been well-documented. Last July, three women said to be "female recruiters" for Boko Haram were arrested. An alleged trainer of women bombers was also detained in Kano in August with up to 16 "trainees". Boko Haram, fighting for the creation of an Islamist state, is now said to be in control of all three borders of Borno state with Niger, Chad and Cameroon, as well as dozens of towns and villages in Borno and the neighbouring states of Yobe and Adamawa. Security analysts said the Baga attack was likely against civilian vigilantes assisting the military and was an ominous sign of increasing violence before general elections next month.